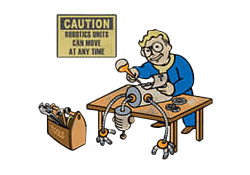 Robotics Expert is a Perk in Fallout 4. It is associated with the Intelligence Stat. Rank 1: Machines will always serve humans, if you have anything to say about it. Hack a robot, and gain a chance to power it on or off, or initiate a self-destruct. How does the perk robotics expert work? Is it like FO3 when if you sneak up on a robot it can be disabled? If so what can you do with them other than shut them down/ blow them up? Can you frenzy them or make them a temp. follower?